It’s a fact of life that we all have to accept that sooner or later the dead will rise from their unquiet slumber, gather in great mobs and storm through your town, devouring the flesh of your neighbours who, in turn, will rise and continue the slaughter until only a few plucky survivors remain. The question is, what will you do in the face of this terrifying inevitability? Curling up into a foetal position and crying is an option, but in the end that won’t help anyone. The truth is, your own real chance is to make sure that when the zombie apocalypse does arrive, you’re prepared. The first thing you need to understand about zombies is that they are very stupid creatures. They won’t be planning any strategies or cunning plans. A zombie’s thought process goes “See a thing. Does thing look like a person? If yes, walk towards it. If you reach thing, start biting.” This makes them extremely hard to negotiate or reason with but exceptionally easy to trick. When the zombies see your windows that’s what they’re going to walk towards. They’ll probably lurch straight past the front door to get to them. For this reason it’s important that your windows are reinforced, so a strong, high quality set of double glazing will be invaluable. This also means that when you send scavenging parties out for supplies you can lure zombies over to the double-glazed windows, while your scavengers slip out the front door unnoticed. Of course, sometimes the zombies are going to notice survivors coming in and out of the house, and being creatures of no imagination when they get a door slammed in their face they’re just going to keep knocking at it trying to get. Ensure you’ve got a decent set of locks on the door, and possibly a chain so that if you get ambushed opening the door you and your family aren’t instantly doomed. Make sure the door is a good fit for the doorway, with no pesky cracks along the edges a zombie could get its fingers through. If there are gaps, particularly around the bottom of the door, try fitting a draught excluder. Remember, even the tiniest scratch can infect somebody, so take no chances. According to all the best zombie movies, the undead are incapable of flight. However real life isn’t always like the movies, so are you really willing to take that chance? Okay, you know how last year the CDC did a blog post about zombie preparedness that was actually designed to trick you into being prepared for other disasters? I was sort of trying to do the same thing but with energy efficiency. So like, instead of keeping the zombies out, it’s keeping the heat in sort of thing? Because you know, global warming is like a real apocalypse, and energy bills can rise like zombies from the grave... It’s not a perfect metaphor! Okay? So, get some double glazing, insulate your loft, use draught excluders. And buy a shotgun. You can’t go wrong with a shotgun. Chris Farnell is a freelance writer who has worked with the Double Glazing Forum and writes about home improvements when he isn’t boarding up the windows and storing up tinned food. 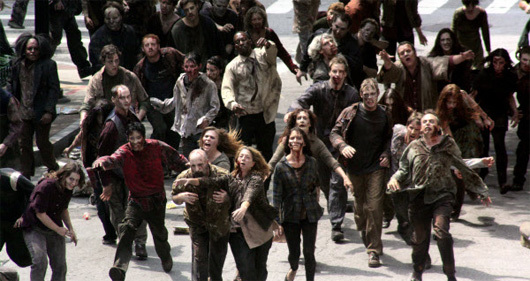 Do You Believe a Zombie Apocalypse Could Actually Happen? Weigh In!